This important book is the re-titled third edition of the extremely well received and widely used Agricultural Extension (van den Ban & Hawkins, 1988, 1996). Building on the previous editions, Communication for Rural Innovation maintains and adapts the insights and conceptual models of value today, while reflecting many new ideas, angles and modes of thinking concerning how agricultural extension is taught and carried through today. Since the previous edition of the book, the number and type of organisations that apply communicative strategies to foster change and development in agriculture and resource management has become much more varied and this book is aimed at those who use communication to facilitate change in agriculture and resource management. Communication for Rural Innovation is essential reading for process facilitators, communication division personnel, knowledge managers, training officers, consultants, policy makers, extension specialists and managers of agricultural extension or research organisations. The book can also be used as an advanced introduction into issues of communicative intervention at BSc or MSc level. 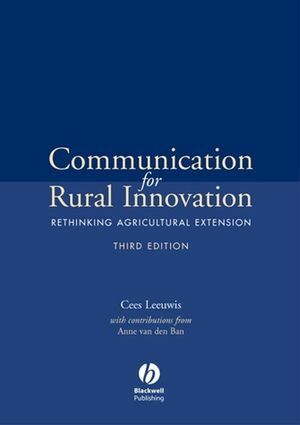 Cees Leeuwis is the author of Communication for Rural Innovation: Rethinking Agricultural Extension, 3rd Edition, published by Wiley. Anne Willem van den Ban was a Dutch scholar, whose work focused on agricultural extension. 2. From Extension to Communication for Innovation. 3. The Ethics and Politics of Communication for Innovation. 4. The Role of Communicative Intervention in Policy Planning: Instrumental and Interactive Approaches. PART 2. THE RELATIONS BETWEEN HUMAN PRACTICE, KNOWLEDGE AND COMMUNICATION. 5. Understanding Human Practices: The Example of Farming. 7. Communication and the Construction of Meaning. PART 3. INNOVATION AS A PROCESS OF NETWORK BUILDING SOCIAL LEARNING AND NEGOTIATION. 8. Changing Perspectives on Innovation. 9. Social and Individual Learning. 10. Negotiation Within Interactive Processes. 11. The Role of Outsiders and Different Intervention Approaches. PART 4. MEDIA, METHODS AND PROCESS MANAGEMENT. 12. The Potential of Basic Communication Forms and Media. 13. Communication for Innovation Methods. 14. The Management of Interactive Innovation Processes. 15. The Planning of Individual Activities. PART 5. ORGANISATIONAL AND INTERORGANISATIONAL ISSUES. 16. Organisational Management, Learning and Research. 17. Agricultural Knowledge and Information Systems. 18. Privatisation and the emergence of ‘Knowledge Markets’. 19. Co-operation Across Scientific Disciplines and Epistemic Communities. 20. Approaches and Issues for Further Conceptual Research.